infKuba is a state-of-the-art, multi-client capable web application featuring a central data storage (source of teaser photos: property of WEMO-tec). infKuba applies proven solutions for the maintenance management of engineering structures. This was adopted from KUBA 4 and KUBA 5 and systematically configured to the requirements of the cantons and cities. With infKuba the inventory or the Bausubstanz of a building can be recorded simply on a structure or a structural component level. Wherever expressly desired, additional levels of such as (Beispiel nennen) and individual fields may also be incorporated. 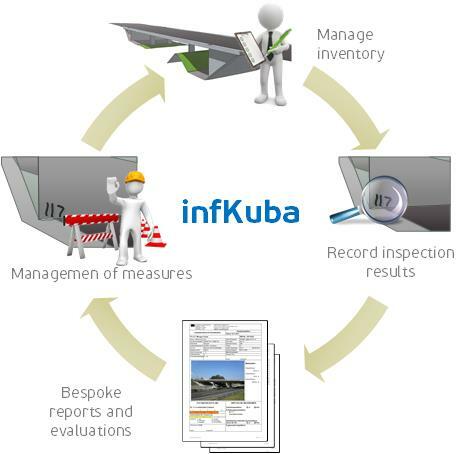 infKuba allows you to record inspections and observations efficiently using mobile equipment. With infKuba you can manage revised planning, approval and acceptance processes easily. infKuba is a very adaptive software tool. It is easy to use, efficient and guarantees low operating costs. infKuba features open interfaces which can swap the necessary data with the established maintenance management systems, such as MISTRA, Logo and others. Needless to say, it is possible to adopt the cantonal KUBA 4 and KUBA 5 data without any risk of data loss. Generation of high quality inspection reports, network status reports etc. infKuba allows you to manage your engineering structures easily, efficiently and in accordance with your respective requirements. infKuba is a state-of-the-art, multi-client capable web application featuring central data storage.